Musea in Gebaren (‘museums in sign language’) is a joint initiative by Foam and Wat Telt!, with the goal of making art and culture accessible to people who are deaf or hard of hearing. In Musea in Gebaren, Foam and Wat Telt! combine their strengths, knowledge and expertise to make the cultural offer in the Netherlands more accessible to people who are deaf or hard of hearing. It is a programme that offers participants training and an opportunity to gain relevant work experience. In this way, the project not only contributes to a more accessible cultural offer, but also to more employment opportunities for the deaf and hard of hearing. First launched at Foam and greeted with much enthusiasm by deaf visitors, the Musea in Gebaren project started in March 2016 with eight museums in Amsterdam. Participants received an internal training to become a 'Deaf Museum Guide', and then went on to work as a professional tour guide in one of the participating Amsterdam museums. After a very successful first year, museums outside Amsterdam are also joining Musea in Gebaren. In developing the programme, Foam and Wat Telt! have sought to ensure nation-wide coverage, with a focus on areas where communities of deaf people are located. Following the launch of the programme in early 2016, twelve deaf participants were trained internally to become deaf museum guides. Nine major museum institutions in Amsterdam (the Rijksmuseum, Van Gogh Museum, Stedelijk Museum, Tropenmuseum, Jewish Cultural Quarter, Hermitage Amsterdam, the Nieuwe Kerk, EYE Film Museum and Foam) joined forces to offer programmes in Dutch Sign Language (NGT) as from September 2016. In a six-week training programme, twelve young participants were given an internal course to become a deaf museum guide, learning the theory and practice of offering tours. After completing the training, the participants were linked to the participating museums where they can put their knowledge and skills to use as a professional tour leader. Starting from 2018, Musea in Gebaren will also be represented across the country. The Amsterdam Museum, Boijmans van Beuningen, Centraal Museum Utrecht/Nijntje Museum, Drents Museum, Groninger Museum, Van Abbe Museum and the Leiden Botanical Garden will start offering activities in Dutch Sign Language, in addition to the nine Amsterdam museums that are already participating. Thirteen new candidates have been selected for the training programme. These new deaf tour guides will spend the coming year working at one of the seven new museums that have joined the Musea in Gebaren initiative. Musea in Gebaren also provides training to the participating museums and is seeking to become more professional by adapting the museum's lexicon and by training interpreters. To stay up to date with the Musea in Gebaren project, follow the Facebook page. Foam has almost ten years of experience in working with deaf people and in training deaf tour guides. The Foto’s in Gebaren project started in 2006. 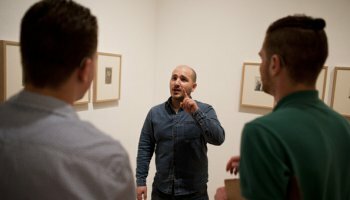 Foam was the first museum in the Netherlands to employ deaf tour guides to give guided tours and workshops in Dutch Sign Language and in Dutch Supported by Sign Language (NMG), on request. Foam is still one of the few museums in the Netherlands with a structural offer for people who are deaf and hard of hearing, in their own language. The Musea in Gebaren project is changing this. The training courses are given by Wat Telt! ; an organisation consisting of the two deaf sisters Martine and Roos Wattel. Martine is a museum lecturer with seven years of experience at Foam. She has also given guided tours of the Rijksmuseum. For her Master’s degree in Deaf Studies, Martine has researched the use of deaf role models in domestic settings and in education. Roos advises art and cultural institutions on improving accessibility for specifically the deaf and hard-of-hearing target group. She also organises events and projects. Musea in Gebaren is made possible by NSGK (de Nederlandse Stichting voor het Gehandicapte Kind), the Revalidatiefonds and VSBfonds. Tours in Dutch sign language.